Oh my goodness, that's lovely! The shawl is lovely. I remember trying to break the 130 mark. Now, I try to stay way under. Not easy, no B&J.. but altogether possible. Way to go! Julie, the child and Birch are both lovely. 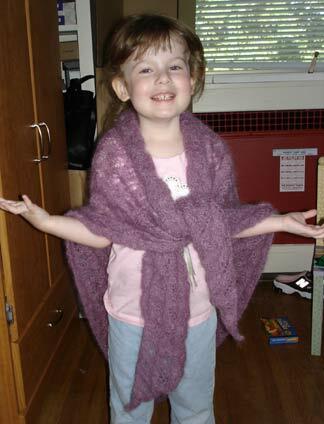 Hi Julie - Lovelovelove the shawl- where did you get the pattern? Your patterns are going up on the website tonight! Your Birch came out beautiful! Doesn't it feel great to finish?! Mmm, it looks gorgeous. Cute Mini Rachael! Looks really cute on little one! pretty, pretty. i would never attempt lace but you make it sound so doable. I tried a bookmark, i gave up!